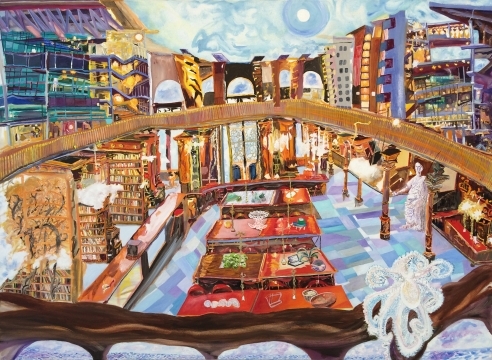 Bookstein Projects is pleased to announce an exhibition of new paintings and works on paper by Olive Ayhens. This is the artist’s first solo-show with the gallery. This is Bookstein Projects’s inaugural exhibition at 60 East 66th Street. This exhibition will feature recent paintings and works on paper created over the last three years. In this latest body of work, Ayhens paints urban, ecological and interior landscapes including a Florida swamp, the Brooklyn Public Library and the Manhattan skyline as seen from the artist’s studio in Dumbo. While these locations are selected through passionate research, subliminal dwelling and observation, Ayhens often transforms them into fantastical landscapes all their own. Frequently, modern architecture, endangered species and natural disasters occupy a single composition. This cacophony of imagery is made all the more surreal by a palette of super-saturated colors and undulating planes of space. This latest body of work also highlights the artist’s continued interest in climate change and over-development. Ayhens often introduces these topics into her paintings as misplaced oddities in an otherwise wistful composition. In Lettuce Lake, for example, the marshy terrain of a Florida swampland is punctuated with both protected birds and deteriorating automobiles.In Oceanic Library, an endangered octopus creeps into the lower right corner of the composition. While it could easily pass for another piece of marble statuary in the library’s reading room, closer inspection reveals that perhaps the entire library may be at risk of similar extinction. Water rises from the bottom of the picture plane as damp clouds descend on the stacks threatening to destroy the books and information they hold. Olive Ayhens: Lettuce Lake will be on view from November 7, 2017 – January 6, 2018. A reception will be held on Thursday, November 9th from 5:00-8:00pm. Gallery hours are Tuesday through Saturday, 11:00 am to 6:00 pm. For additional information and/or visual materials, please contact the gallery at (212) 750-0949 or by email at info@booksteinprojects.com.